Dollywood announces a season dedicated to shows! Dolly Parton came to Dollywood on Friday and revealed a host of new entertainment experiences and a new venue coming to the theme park in 2018. An investment that's "$1 million greater than any season-long entertainment schedule in the park’s history" will fund these new additions to the park, according to a Dollywood press release. 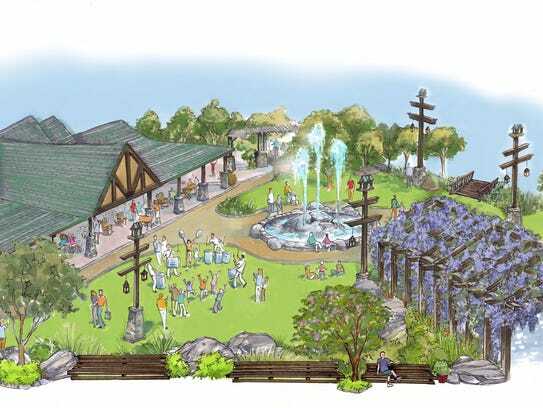 A new venue will house different events that correlate with the park's many festivals, according to Dollywood Public Relations Manager Wes Ramey. "So what will happen is throughout the year we'll be able to take the programming for each of the festivals and theme that area so that guests have an immersive experience they can sit down, take a break and just enjoy the atmosphere for whatever festival we're in," said Ramey. In addition to the venue, several musicians and entertainers will make the trip to Pigeon Forge in 2018 to perform at the park. A new three-week-long festival, the Spring Mix music series, will take place from April 11-29 and feature a week of classic country music, a week of inspirational music and a week of classic rock and folk music. The event will have performances from Pam Tillis, Connie Smith, Shenandoah, Amy Grant, The Blind Boys of Alabama, Larnelle Harris, David Phelps, Chonda Pierce, The Marshall Tucker Band, The Drifters, Debby, Firefall, Al Stewart and others. Individual concert dates and show times will be announced later, according to the press release. Dollywood’s Rock the Smokies event on Aug. 25 will feature Christian music artists TobyMac and Crowder serving as headliners. "Well it's good 'cause a lot of them are the oldies from my time and a lot of them I know personally ... but I think that it's good," said Parton. "It gives people a variety, too. We have, of course, our country week, our inspirational groups that come in and Amy Grant and a lot of people." Other new additions include adding another week to the park's Barbecue and Bluegrass event in the summer (May 25-June 10), an expansion of the park's Great Pumpkin LumiNights in the fall and new summer entertainment from DRUMline Live!, which was inspired by the 2002 movie "Drumline," and "America's Got Talent's" iLuminate, who combine dance moves and glow-in-the-dark costumes. How perfect is this? A year of improvements plus a park area. I always love grassy/natural areas in parks, it's why Alton Towers is such a great park in my opinion. The new break area is perfect for people waiting for others, and the new show lineup is, as always, the best in the business. This is the stuff that keeps Dollywood one of the best parks in the world, can't wait to see the additions for next year!